The year 104 BC ended with manoeuvring as the victorious army of Quintus Servilius Caepio (and that of his sub-general Gnaeus Mallius Maximus), together with the combined, previously defeated armies of Gaius Marius/Quintus Lutatius Catulus and Marcus Junius Silanus/Lucius Cassius Longinus sought to defend Rome from the rampaging Cimbri and Ambrones. Caepio and Maximus’ glorious victory at Firmum had provided some respite from the seemingly endless defeats of the past two years, but the senate and people of Rome were still anxious at the proximity of the barbarians to the city and their rapacious pillaging of the northern Italian provinces. 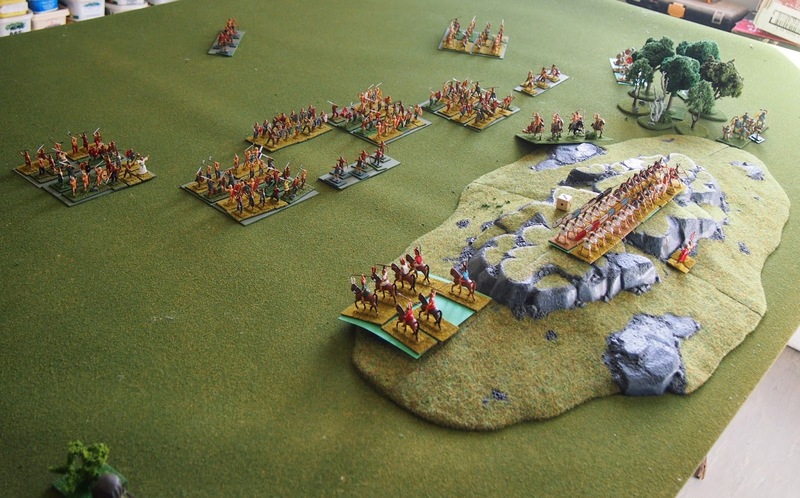 The senate therefore ordered the raising of another army of reinforcements, drawing in two more veteran legions from Hispania and recruiting three new legions from the displaced citizens of northern Italy. These troops were to be commanded by Marius’ bitter enemy Quintus Caecilius Metellus Numidicus along with Lucius Appuleius Saturninus (Marius’ ally). 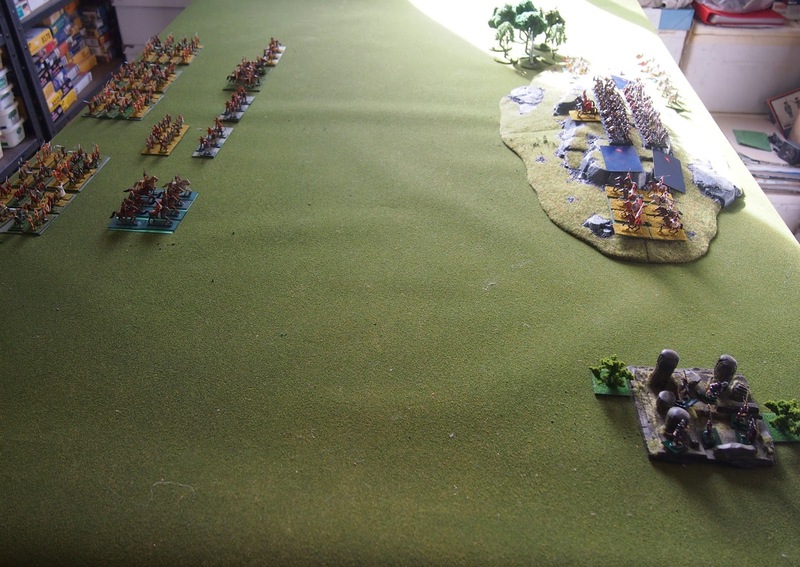 Thus reinforced, and in close proximity to one another, the Roman armies prepared to confront the barbarian tribes. 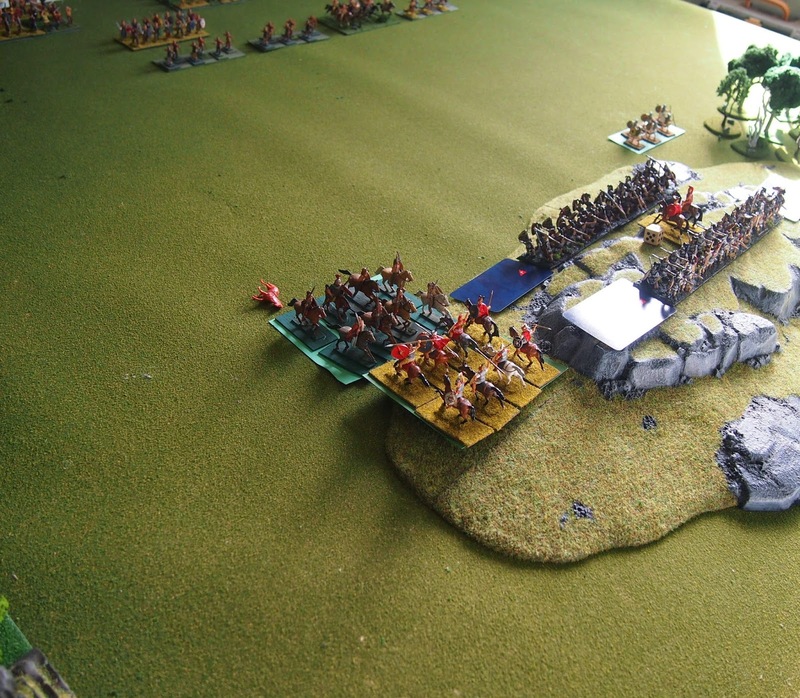 While Metellus’ and Saturninus’ newly formed army remained around Rome, training the new recruits and manning the defences of the city, the other Roman forces moved north to face the Cimbri and Ambrones. 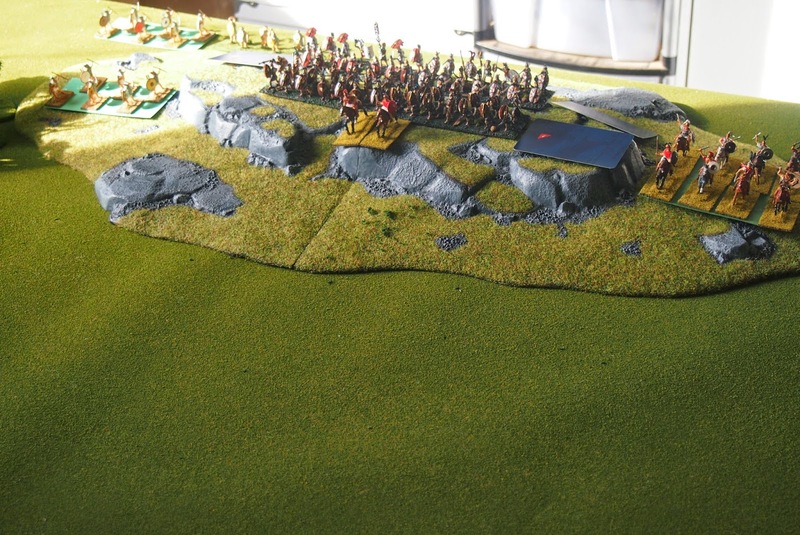 Caepio/Maximus’ troops met the Cimbri in Perusia. Not wishing to engage equal numbers with his army, dominated by partially-trained legions, Caepio took position behind the Tiber. 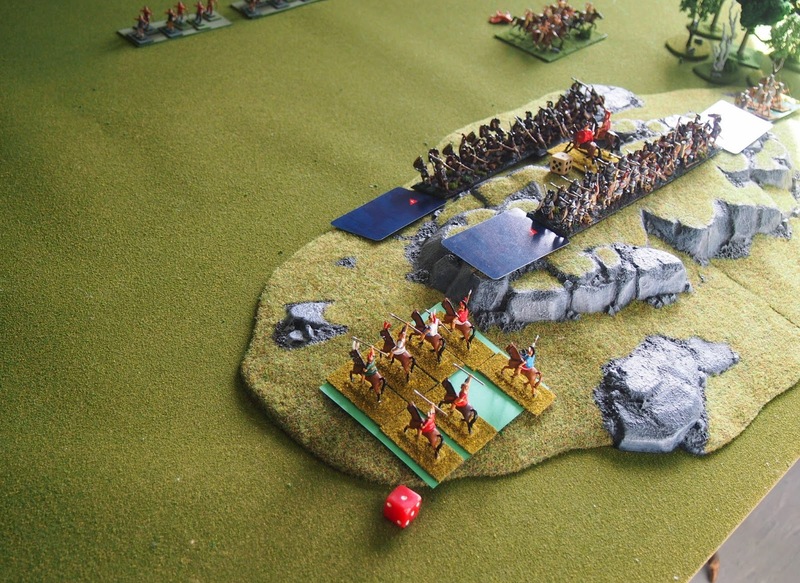 The Cimbri were not to be tempted to attack such a position—chalk up another four training points for Maximus’ legions (now up to 10 from a maximum possible 11)! 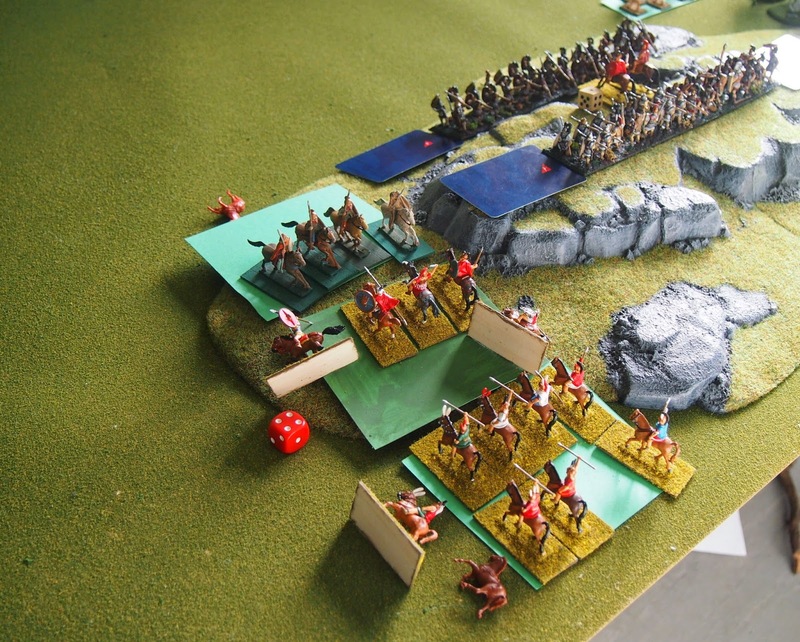 The Ambrones sent forward their right-hand cavalry unit to engage Silanus’ Roman cavalry. 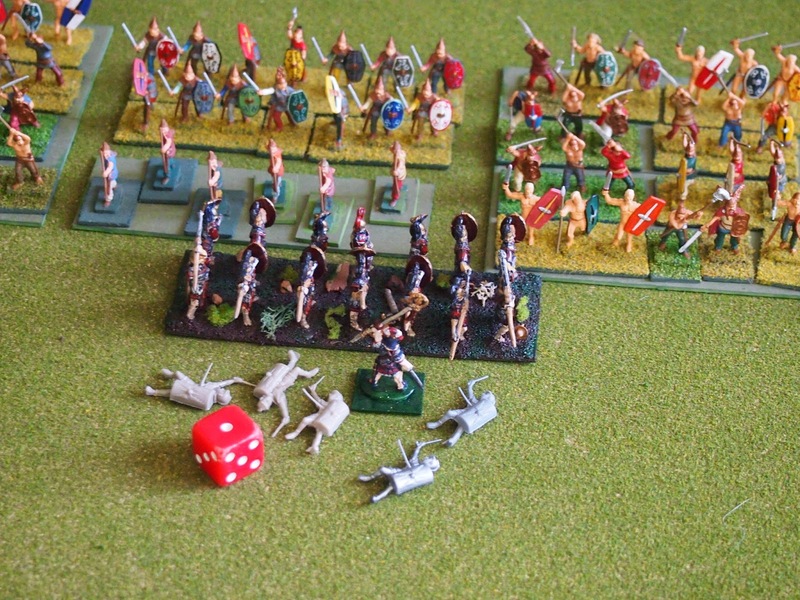 The Romans lost the resulting mêlée (a six to determine permanent losses is not a good roll!). 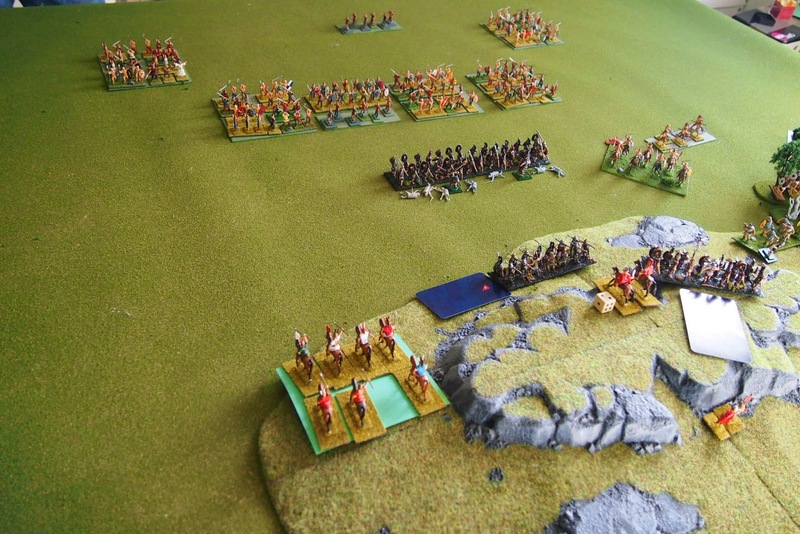 The Ambrones’ cavalry pursued, to finish the job, forcing the defeated Roman cavalry into their Italian allies behind. 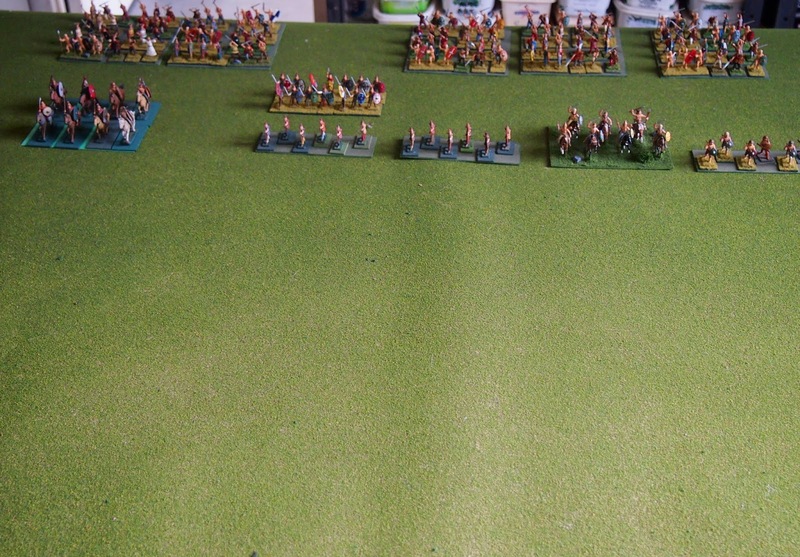 Although disordered, the Italians charged into the Ambrones’ cavalry, breaking them in turn. 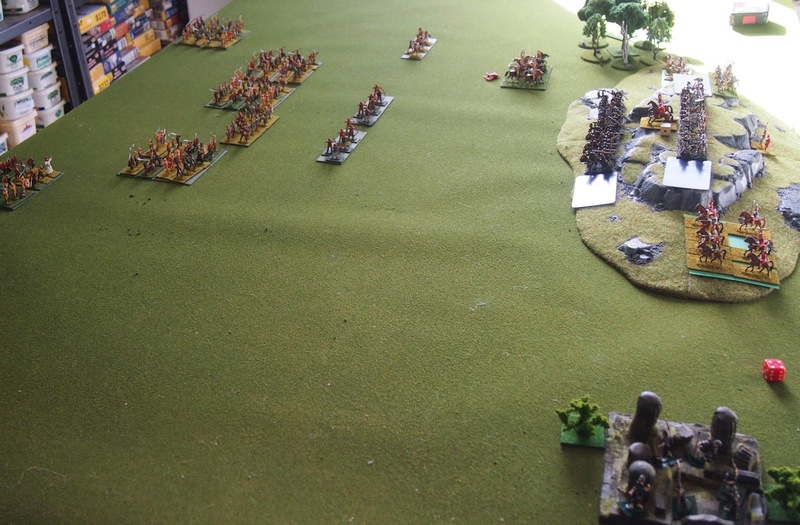 The table at the end of an eventful first turn. Silanus sent his Legio II forward (a spade produces the lowest quality for a legion). 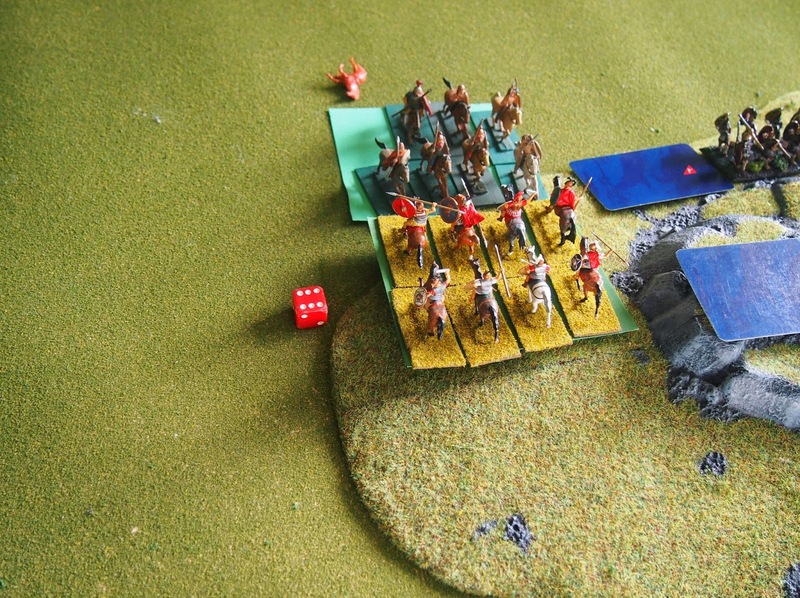 They were met by a hale of accurate fire from the Ambrones' bowman. 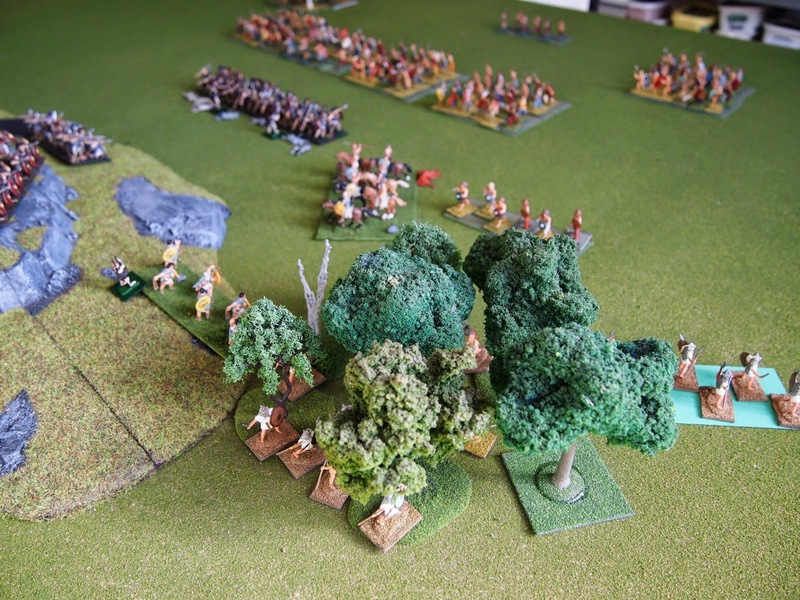 The Roman velites moved through the wood to threaten the Ambrones' left flank. 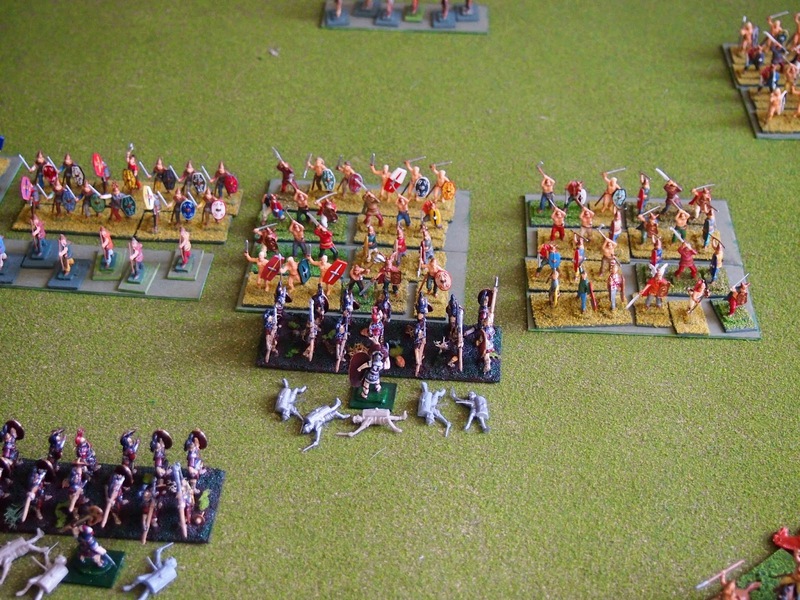 The two ‘units’ of Legio II charged the Ambrones’ warbands, and both suffered devastating defeats. 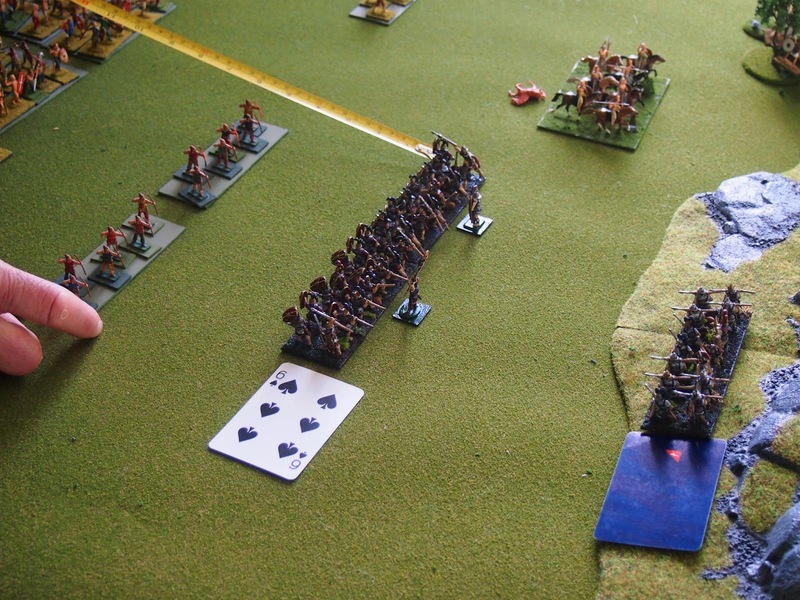 It was all over before it had even began, as this loss broke Silanus’ command (on turn 3!!). Marcus Junius Silanus fell on the battlefield#, or perhaps he did the honourable thing, as his command had effectively ceased to exist. Another major loss for Rome, and a huge blow after the optimism engendered by Firmum. I am sure the Romans will come back. Thanks for the support Mark! We have two games yet to play from the next campaign turn. I expect them to be 'defining', one way or another. Yeah, off to see the vestales as we speak...! !